It’s 6am on Stage 19 of the Giro and we’ve found an open coffee bar in Pinorolo. You know the sort where an espresso is €1 and tastes incredible. This was going to be a great day. I had been invited along to take part in a Grand Tours Project trip, to find out for myself just what it is really like to ride at the Giro D’Italia, the Italian cycling passion that is the Maglia Rosa. The four other guys (Steve, Graham, Christian and Tim) left the stage 19 depart this morning, filled to the brim with Italian roasted coffee and jam paninis. I was less convinced that I could make the full stage distance, so I started my journey at 60km in, a small town called Sampeyre, en route towards the first Col- the Colle Dell’agnello, the third highest paved mountain pass in Europe (2,744m). Sampeyre was alive with the colour pink (and lots of other colour bib shorts which certainly can only be worn in Italy…just). Winding my way out of the town I was climbing from the off, settling into a rhythm and anticipating the excitement of the day ahead as I passed one pink balloon adorned house after another. On arrival into the town where the climb really started I felt like I had slipped into a camper van expo. Hundreds of them all crammed onto the side of the road, that road being the one with still slightly tacky Tarmac filled potholes. Nothing like a last minute job! 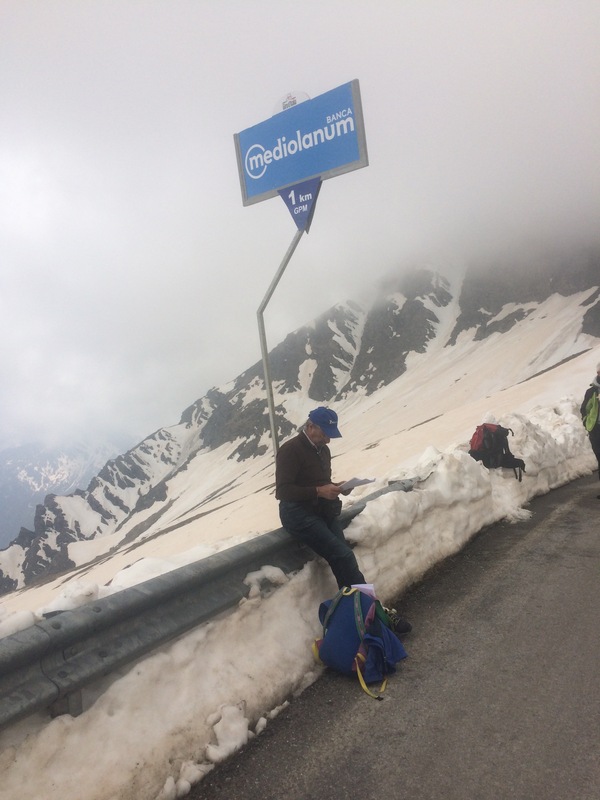 Then the TV trucks started to pass through, huge lorries that started snaking their way up the small switchback road, along with a large contingent of Italian Giro Fans, all starting the walk up to find ‘the spot’ to view the passing peloton. It was amazing. Hard, steep, hot, but amazing. It went on in that manner until the snow started to appear, and the full realisation of what lay ahead unfolded before my eyes. I played tag for a km or two with a man who must have been in his eighties. He was riding a heavy looking bike that was just about working, and spoke no English, but we exchanged smiles and encouragement in broken language which helped up the steep bits. Pleased to reach the utter chaos of the top (tiny Col, big trucks) it was a quick throw on of warm clothes and down the other side into France, where the sweeping descent led through the last reminants of the winter snow into the warm air of the valley, the quiet road stretching out for miles ahead with only a few cyclists making the ascent. After a quick regroup and refuel at a beautiful refuge (coke and sausage crepe), the group headed further down the valley and into the gorge where freshly tarmaced roads enabled us to pick up speed and enjoy the thrill of the ride. I felt somewhat cheated on this descent as we hit a strong headwind and had to pedal hard. It wasn’t long before I was split off the back, Alain using the van to draft me back onto the group. Brilliant fun! Then the clock started to tick. A puncture stop allowed us to assess the time- were we were on the course? Where was the peloton might? Even more importantly, when would they close to road to Risoul? Rocketing down to Guillestre we were stopped by what would be the first of many French police, la gendarmerie. Road closed. Along came Monsieur Rumpf, the man with the stickered van and all of the chat required for such an occasion. “Go, go” Alain whispered to us out of one side of the van window whilst chatting to the police on the other. Graham and I shot off and before we knew it we were climbing up to Risoul, to the stage finish, clock ticking away. The afternoon sun, average gradient of 8% and legs like lead after the D’Agnello all started to take its toll. Every kilometre marker was counted down as small victories. Kilometres 7 and 8 to go were particularly pleasing as the occasion was sponsored by an Italian ham..! Fans lined the route and we were stopped every couple of hundred meters by diligent police. Que deployment of Alain, accreditation chat and me just pedalling upwards, albeit very slowly. The impending arrival of the peloton loomed in my mind, the pressure was on. Two options available. Crack on, or get in the van. So I cracked on. I’ve never started a climb and failed, given up or taken a lift. However with the team buses now starting to go by, sliding past me with inches to spare, the reality of how close this was getting hit hard. A few minutes later and I was away, with fear (of getting caught) and fire (and the sugary saviour) in my belly to get me through the final 5km. Shouts of ‘Bon Courage’, ‘Bravo’ and ‘Allez Allez’ gave me more fuel for the climb and before long the 3km mark was met, then 2km and then the holy grail: la flamme rouge. It must be an incredible feeling as a pro to hit this stage in the race, especially on a mountain top finish like this one. 1 more km of pushing to your limits, the finish line in sight, crowds lining the route and shouting your name. It’ll certainly be the closest I’ll be to a pro. So, we made it! All riders up to the finish and huge smiles all round. It was a true personal achievement and another episode of digging deep and gritting teeth, all the while attempting to take in the sights and sounds of my first ridden grand tour stage. 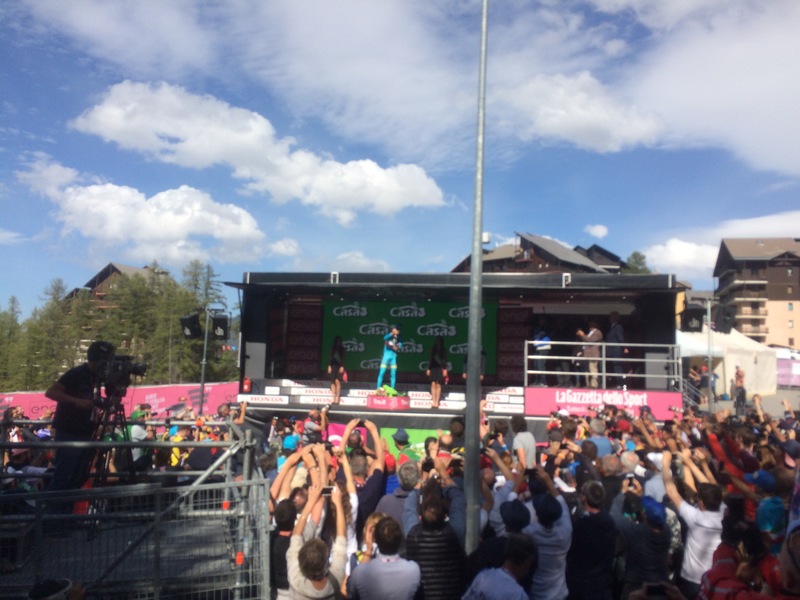 We watched Nibali cross the line and his tears of joy that followed, and I too had a tear in my eye. What a day. What an experience. This was our #giroproject. So today the guys will ride stage 20, 134km and 4000+ metres of climbing- Col du Vars, Cime de la Bonnette, Colle della Lombarda and the stage finish in Sant’anna Di Vinadio, before we will all ride stage 21 tomorrow, the final stage of the Giro Italia 2016. Part two of my experience to follow. Many thanks to Alain and Keith of Grand Tours Project. You can follow the rest of our #giroproject on Twitter @grandtourspro and Instagram @grandtoursproject. What a fantastic experience Bethan, well done.